If you would like to catch a stock making a 60 min uptrend, then this is a trading strategy that will help you to do so. A stock can also form an uptrend in the 60 min chart. A 60 min chart is an hourly chart. That means that each bar represents one trading hour. Your job in this trading strategy will be to ride the trend up for a few days to a week or two. Bullish crosses can happen through the combination of a faster moving average as well as a slower moving average. I tend to like to use the 60 min 20 MA and 50 MA. A bullish cross happens when the 20 MA cross above the 50 MA. This is a potential sign of bullishness and therefore it can give us an early hint that the stock is about to start a new 60 min uptrend. A 60 min box consists of congestion period of two days. Each trading day has about 7 hours of trading. That means each day will have 7 bars of hourly candlesticks. We want to see the stock consolidate or trade sideways for about 10-15 bars. At times a bit longer. This forms a kind of box and when it breaks out of the trading range we buy the stock. A picture is worth a thousand words. So here is what the 60 min bullish cross box trading strategy looks like. First of all, do remember that this is an hourly chart. So press the H button which stands for hourly or 60 min on your charting software to get the hourly chart. Notice how the SPY above satisfy this condition. There was a bullish cross and there was a consolidation for about 4 days. We can easily draw a box. Buy the stock when it trades above the highs of the box and ride it higher. Stop loss are important and thankfully the setup itself gives us a very easy way to manage the trade. Once you draw the box, you will be able to see clearly where you should place the stop loss. Just put the stop loss at the lows of the box. Draw a box when you see a 60 min bullish cross alongside a sideways trading range in the 60 min chart. You should try to find a trading range that is tight and not wide and whippy. For example if the trading range is $1-3 for a few days then it will be fine. However, if the stock jumps up and down and the entire range is like $5 - $10 then that is not a very good box. This is an example for a stock that is about $50. If the stock is $250 then I suppose a $5 trading range will be fine. Below are extra examples to help you learn how to spot these kind of setup. ALXN had a bullish cross. It also had a trading range of a few days. A trader can draw a box to contain the trading activity. Once you draw the box, everything falls into place. You have your setup. You know when to buy the stock and where to put a stop loss. 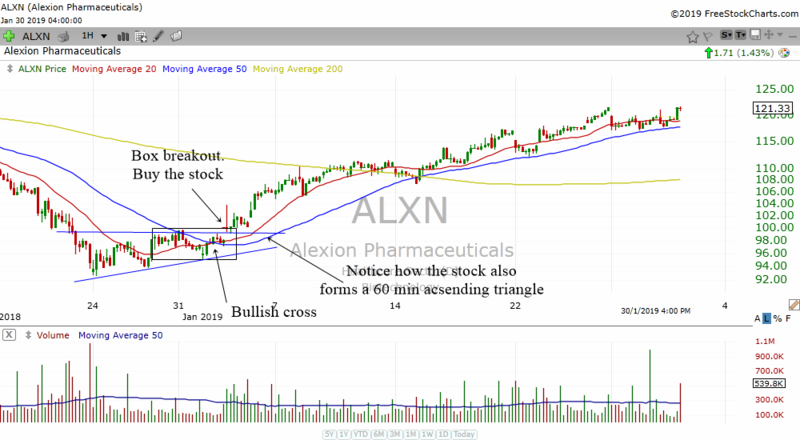 Notice how ALXN also begin making higher lows. By the time it broke out it already had a second higher low. This tells us that the stock is rejecting to go lower. You will also notice that it formed a 60 min ascending triangle. By opening our eyes. we can often see many signals that the stock wants to go up. A 60 min box in combination with other chart patterns can be very helpful to spot a reversal. 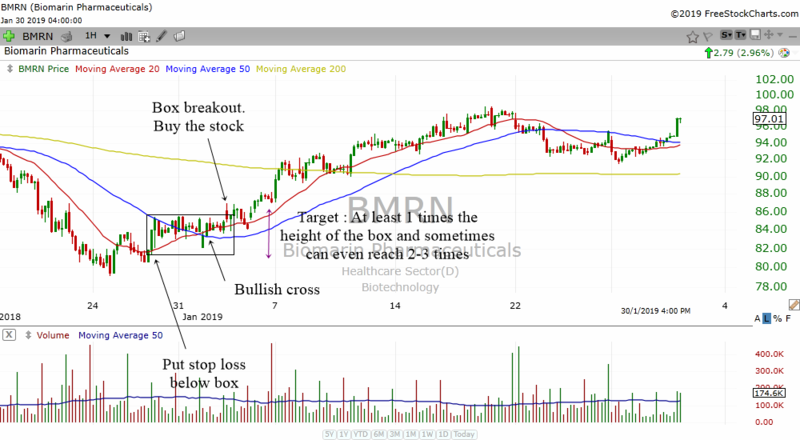 BMRN is another stock that created a nice setup. We have a bullish cross and then a box. 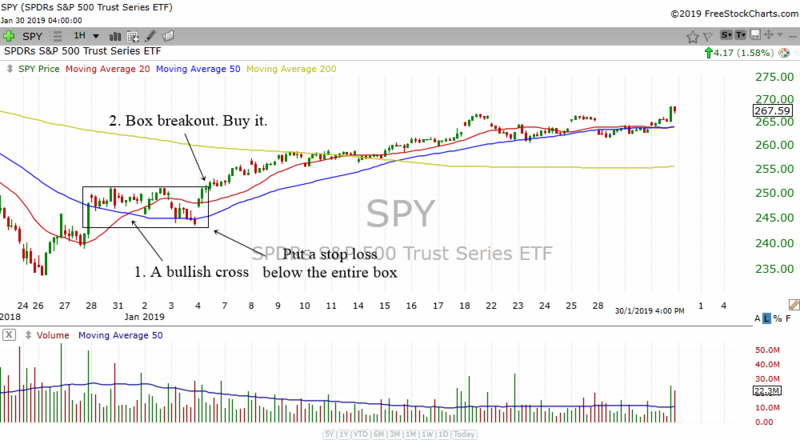 Buy the stock when it breaks above the high of the box. To get a minimal target, the height of the box is the answer. But more often than not you can get 2 times the height of the box. Sometimes even 3 times because you are riding a new uptrend. The length of the box can also be used as a target. If you know your technical analysis well, the length of the box can be used to project vertically to get a target. A very nice new 60 min uptrend will rarely drop below the 60 min 50 MA. Thus if your stock has been going up for some time and you see the stock drop below the 60 min 50 MA, then take some profits off the table. Odds are the 60 min uptrend is getting tired. 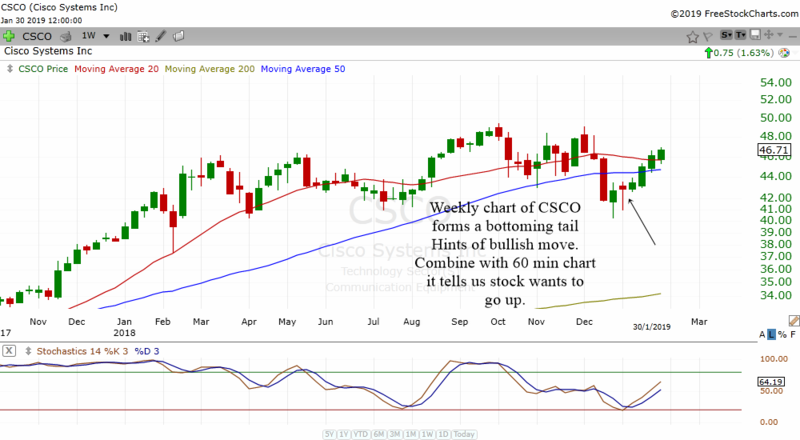 In the chart above you can see CSCO which offers us a very interesting view of the strategy. It formed a first 60 min bullish cross. However, there was no box breakout. Therefore a trader should not have entered the stock. Later the stock formed another 60 min bullish cross. This time, it provided us with a trading range and it eventually broke out of the trading range. That was the time to buy. The chart above is the weekly chart of the same stock CSCO. I showed it to you so that you will know why CSCO went up. Notice how the stock formed a weekly bottoming tail. Bottoming tails are bullish reversal patterns and this gave traders a hint that the stock is rejecting to go lower. In combination with the box setup in the 60 min chart, the weekly chart was telling us that CSCO wants to go up. 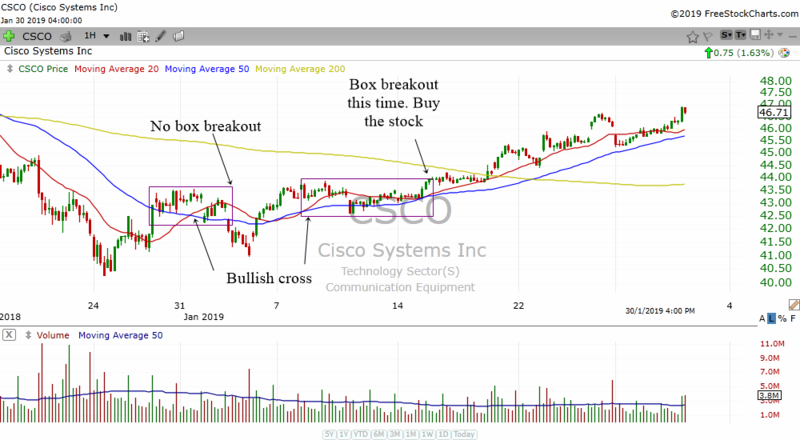 Just because a stock forms a 60 min bullish cross and a box, you should not buy it. There could be more areas but the thing to take note is that if you find a bullish situation or sign in the higher time frames, then the odds of your success in the 60 min chart will increase. Sometimes the holding period could be longer. For example if your stock forms new all time highs and there is not much overhead resistance above you could be riding it for many weeks. 60 min trend changes happen quite often but not so often that you can go in and out of stocks every day. Trend changes in the 60 min chart can happen 1-2 times a month. With that knowledge in mind you should plan your trades when it coincides with a trend change in the general indices. Also try to limit the amount of trades using this trading strategy to 2-3 trades per week. You have now learned a simple 60 min trend following swing trading strategy. You also know when to enter, where to put a stop loss and where to exit. Hopefully this simple trading strategy will help you in your trading.